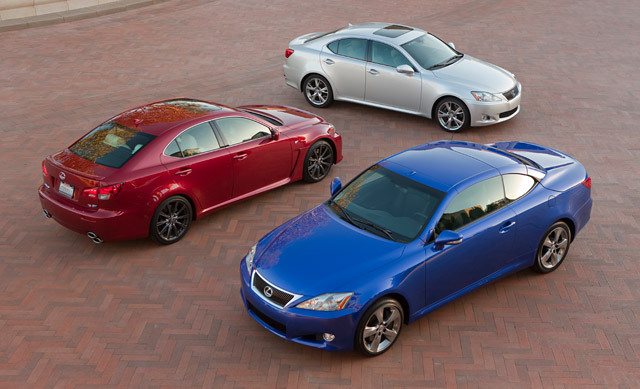 Lexus IS Coupe for 2012? …Lexus could finally add an IS coupe to its lineup. Lexus recognizes that it hasn’t had a credible player in that market for far too long, and with the new Mercedes-Benz C-Class coupe around the corner and the two-door BMW 3 Series holding its own, the obvious question is why hasn’t Lexus done it sooner? According to our sources, it was easier for Toyota to make a business case for the IS cabrio, particularly given the SC430’s imminent demise and Lexus’ need for a drop-top offering to fill the hole. If the coupe does come to fruition – and we’ve been told in no uncertain terms that it’s in the cards – expect the two-door IS to bow sometime in late 2012 or early 2013. And it’s safe to assume an F version will arrive with in year of the coupe’s debut. A IS coupe is an absolute necessity for the next-generation — the convertible was certainly a step in the right direction, but the only way the IS will truly be able to compete with the new 3-Series & C-Class is to match them in all possible variations, if only from a sales perspective.